The Chocolate Cake for Breakfast is not the only mouthwatering and unique breakfast item that the folks at Mama’s Boy can create. I made a second trip to Mama’s Boy and this time decided to go with a small order ( yes, I had been eating 5 meals a day in Athens so a small is all I could handle) of Georgia Peach Stuffed French Toast. I figured that I like French Toast and with Georgia being known as the Peach State, I could not go wrong. My intuitions were correct. The French Toast was superb. 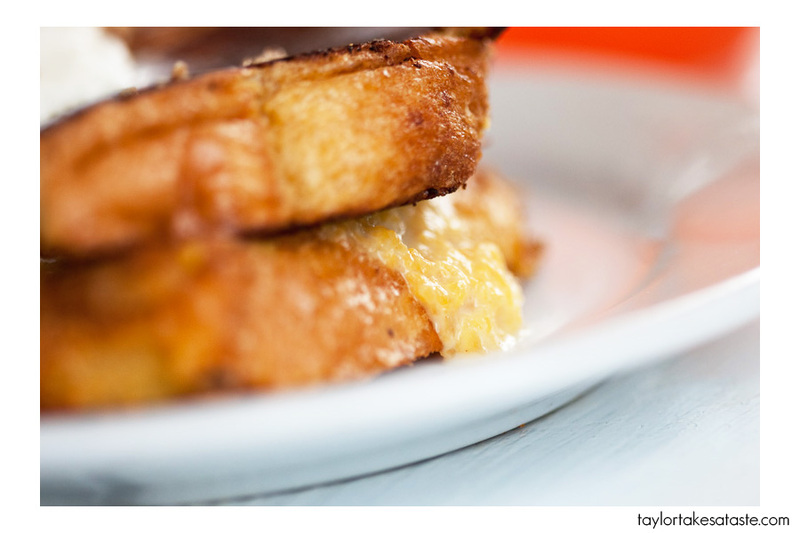 The egg wash laden bread was cooked to that nice golden yellow and splotchy brown that is signature to French Toast. I am not sure what the peach filling was made of, all I know is that it was full of flavor and made me want to lick the plate clean. You could tell by the strands of peach in the filling that only the finest peaches were used in its creation. 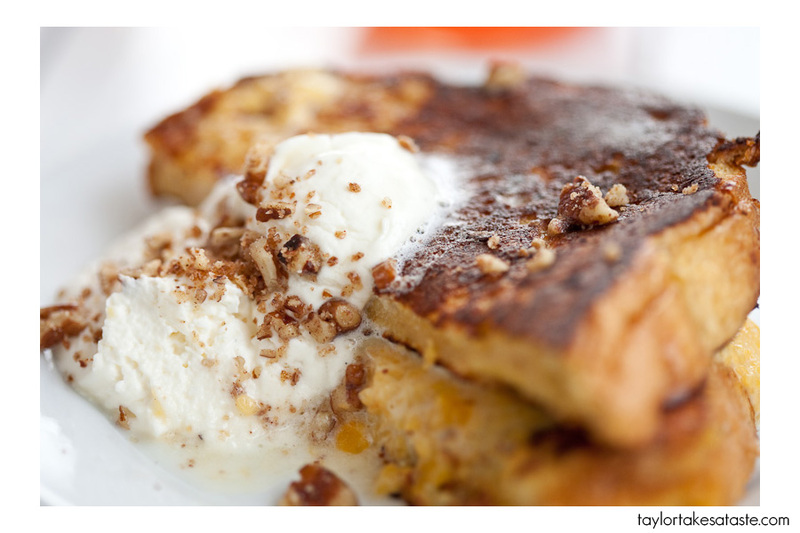 To finish there was a large dollop of vanilla whipped cream and a sprinkling of toasted pecans. Of course there was maple syrup to bathe the whole plate in, but I excluded this from the pictures. Why you may ask? Well once the syrup was put on top I could not resist any longer and the camera was replaced by a fork. My only regret was not ordering the large. Gorgeous shots Taylor! I was surprised to find a post dedicated to my little college town on FG. Thanks Sean! I really like your blog,over the next week I will be posting articles from the other places I visited on my trip. OMG. I think I just gained 5 pounds looking at those first couple of photos. The whipped cream and pecans? YUM. I need to be eating that for breakfast instead of egg whites and fiber twig cereal. Ugh. Ha ha yes Amy they were quite tasty! I wish I could eat them for breakfast every morning. Oh. My. Word. This looks like the ultimate comfort breakfast. 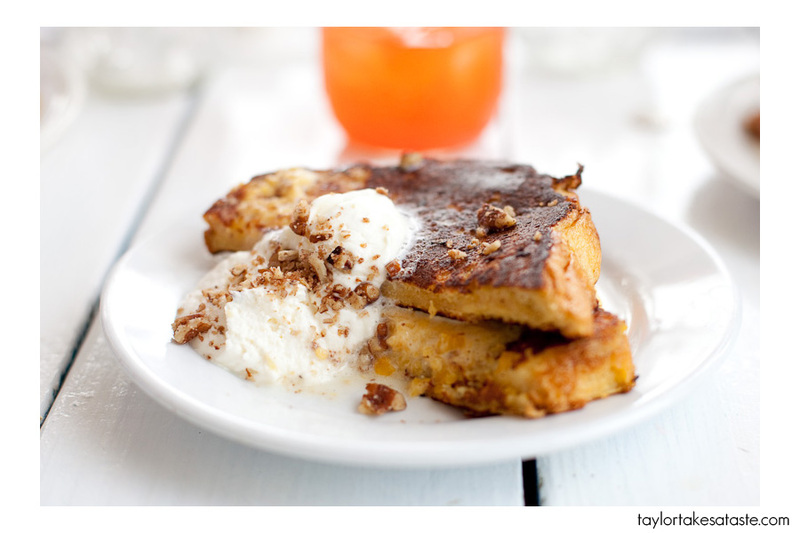 I can’t wait for the weekend to roll around again so I can make this for brunch with the family-YUM! Hey Megan! Thanks for the comment, yeh it was really good! I like your blog as well!